I came to this book with no preconceptions, having bought it on Kindle because someone on Twitter had recommended it as a Victorian ghost story. That’s all I knew. I may have been attracted by the title Florence & Giles – titles made up of two first names are rare and bold, and the novel itself is both. The first few pages threw me. I soon realised that Florence & Giles was, for want of a better phrase, based on The Turn of the Screw, and as an admirer of Henry James I said to myself, this had better be good. It is in fact very difficult to define the exact nature of John Harding’s debt to Henry James. Reworking? Adaptation? Not exactly. Maybe it doesn’t matter. The initial premise is the same, of two orphaned siblings (although significantly, Florence and Giles shared only a father) living in a large, remote house, wards of an unknown uncle but under the daily care of domestic staff and a governess…or two. John Harding has some tongue-in-cheek fun with names; Florence and Giles instead of Flora and Miles, Blithe House for Bly, Mrs Grose the housekeeper becomes Mrs Grouse, etc. Yes, there are distinct echoes of The Turn of the Screw throughout the story but I felt them fading, becoming less conspicuous as the novel assumed a life of its own. 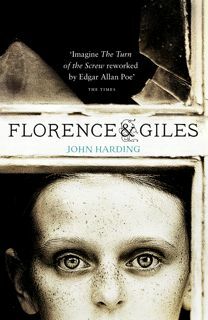 For all its Jamesian influence, Florence & Giles is one of the most original and inventive books I’ve ever read. For many readers, the unique voice of Florence is the making of this book. (It has been a huge hit in Brazil and Italy, despite what must have been incredible translation hurdles.) I attuned to her voice very quickly and am in awe of the way Harding uses it to reveal her complex blend of precocity and searing vulnerability. Florence is a young girl who, unlikely as it seems, has devoured the works of Dickens, Trollope et al, though her true love is Shakespeare. She has taught herself languages she will never hear spoken. She is, as one scene poignantly underlines, a child who has never had a mother. There is such a tangible sense of her isolation, her constant anxiety for the wellbeing of her little brother, and as the story unfolds, of the absolute terror she feels. John Harding creates a world which I not only believed in, I was physically there, stealing along draughty corridors, shivers down my spine. Few literary novels can equal this one for creepy atmosphere; it is absolutely shot through with menace. Following a failed attempt to educate the sensitive and rather dim 9 year old Giles at school in New York, governess Miss Whittaker didn’t last long before she ‘tragicked upon the lake’. The second part of the book begins with the children and motherly housekeeper Mrs Grouse ‘history-repeating-itselfing in front of the house’, awaiting successor Miss Taylor. Believing Blithe to be haunted and convinced right from the start that the sinister new governess means Giles harm, Florence embarks on a horribly risky mission to outwit and unmask her. It is exquisite storytelling, beyond gripping, and at times so terrifying that I could hardly bear to read on. Ironically, Giles turns away from Florence in favour of the interloper, and Florence’s only friend, hapless 14 year old asthmatic Theo Van Hoosier, is drafted in to help her. But will he live to regret it? As the end approaches, there are twists and emotional shocks aplenty. Florence is shown to be alarmingly ruthless and pretty scary herself. She does something I cannot forgive her. Having promised myself I would never again review a book without a hard copy to hand, I bought one and what a good decision that was. It’s a very stylish cover, with a bright turquoise spine. I ordered a few more for Christmas presents. When I sat down to make some notes, I ended up reading it all the way through again. Not only did I enjoy it even more the second time, I felt closer to Florence, the great page-turner. A couple of little details continue to puzzle me, left open to interpretation, as in The Turn of the Screw. Henry James would surely approve. Hi Isabel, and thanks for writing this review, as Florence & Giles sounds wonderful and right up my alley. I’m going to purchase it immediately! You’re welcome, always happy to recommend good books ! I think you will love it, especially as I know you have a special interest in narrative voice, not to mention a unique one of your own. Do tell me what you think of Florence & Giles. Wow. Sounds fascinating. Free sample time! Thanks for the recommendation. Hi Kelly, thanks for your super enthusiastic Twitter follow, tweet recommending my blog and a comment all on day one ! Very pleased to know that you enjoyed the review and I have no doubt that you’ll enjoy Florence & Giles too. Hi Evita – thanks for your comment, it’s always a nice surprise to get one on something I posted a while ago. Not quite sure what you mean by ‘cull’ my review – whatever it is I don’t mind at all but a link would be appreciated if you’re quoting it online.